Filarial nematodes—microscopic, thread-like roundworms—currently infect up to 54 million people worldwide and are the leading cause of disability in the developing world. 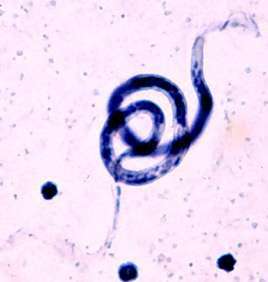 Now, researchers reporting in PLOS Neglected Tropical Diseases have described the relationship between one species of the worm, Brugia malayi, and a bacteria, Wolbachia, that lives in the worm's body. The symbiotic relationship, they found, could represent an Achilles' heel for the nematodes. Genes encoding ribosomal proteins, DNA replication and repair machinery, oxidative stress, and purine biosynthesis were differentially expressed in Wolbachia during the development of B. malayi female worms, suggesting a role of the bacteria in worm reproduction. In addition, the bacteria in all stages of the worms studied expressed genes involved in the synthesis of heme—an iron cofactor—and the movement of molecules and nutrients. Moreover, the bacteria seemed to produce nucleotides not only for their own use, but for the worms when requirements for nucleotides were high—such as during oogenesis and embryogenesis.